Along with the other excuses for not planning that I hear, I'm often asked "what is the point of business planning" by tired entrepreneurs that have convinced themselves that planning has no traction on the "real world". My typical, rapid fire response is that in business, as in all other worthwhile pursuits, preparation precedes power. That answer of course begs the question "what is the power that proper planning stirs within us?". The answer I give to that follow up question is that business planning awakens the power of purpose. How does business planning awaken this power you might ask? Let me answer that question with a question. How would you feel if you saw a framed picture hanging crookedly on the wall? If you are anything like me, you would move quickly to straighten it. I'm so bad in fact that if I knew that there was a crooked picture on the wall, I would struggle to relax until it was straight. "OCD! ", I hear you cry? Well what would you do? How would you feel if you saw someone's jacket collar was half folded up? Would you, like me, fight an overwhelming urge to straighten the collars of perfect strangers after you've noticed it? I've lost count of the times when perfect strangers have lost the battle to restrain themselves and have felt compelled to straighten my dishevelled collar. When we see something in our world that is out of place or kilter, an energy awakens within us to put it right. Now, what has all this got to do with our small businesses or proper planning? We feel the urge to close the gap between how things are and how they ought to be only when we are familiar enough with them to know how they should be. I'm certain nobody would adjust the clothing of a distant tribesman or the ceremonial dress of some of Eastern extraction for fear of either offending that person or simply getting it wrong. Proper business planning has the effect of creating a vivid visualisation of how your business should be in the future. The more vivid this vision of the future, the more disatisfied we will be with the present and the more energy or power we will create in the present to set about getting there. "People who are convinced that a vision or result is important, who can see clearly that they must change their life in order to reach that result and who commit themselves to the result nonetheless, do indeed feel compelled. They have assimilated the vision, not just consciously but unconsciously, at a level where it changes more of their behaviour...All of this produces a sustained sense of energy and enthusiasm, which (often after a delay) produces some tangible results, which can then make the energy and entusiasm stronger"
To further solidify this idea, let's adapt the analogy of a rubber band that Peter Senge uses in his original book, The Fifth Discipline. Imagine stretching a rubber band between two points: an upper point called "Vision" and the lower point called "current reality". Vision represents a vivid representation of your business as it ought to be. Current reality represents your business as it actually is. As you can see in the picture below, there is tension in the rubber band that will eventually need to resolve itself. If the pull of current reality is strongest , the band, or business, will be pulled backwards in the direction of current reality. If on the other hand the pull of vision is stronger than that of current reality, then the rubber band, or business, is drawn up towards the vision and current reality starts to change, becoming closer and closer to it. This is how proper planning awakens the power of purpose within a business: you create and then direct energy to move from the current reality to initiate change towards the vision described in vivid detail in your business plan. We need to be careful not to stretch the vision too high or the band/business might break. An unrealistic vision detailed in a proper business plan will only lead to failure. Likewise, there is only tension in the band/business if one part of us is properly grounded in reality. 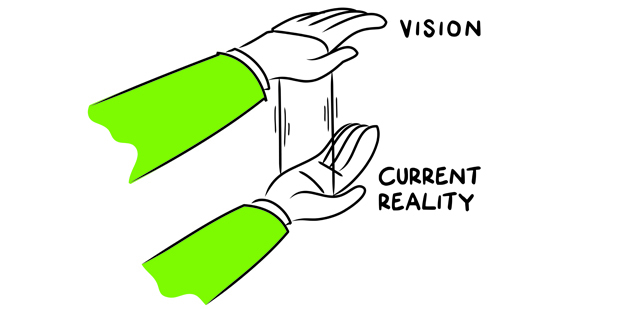 Vision can only create pull if we have a firm grasp of the current business reality we are pulling against. Is business planning a waste of time? It will be if we cannot simultaneously hold a vivid visualisation of the future reality of our business whilst maintaining a strong grasp of the current situation and then acting effectively to close the gap. This is the very essence of Continuous Business Planning. We help you create a vivid vision of the future in our business plans, work with you to understand exactly where your business is today, help you move toward where you want to go and review your plan to maintain sufficient tension to keep pulling you forward. In other words, we use business planning to harness the power of purpose. Proper planning and preparation precede power. If you want our help to harness the power of purpose through continuous business planning, call us today.